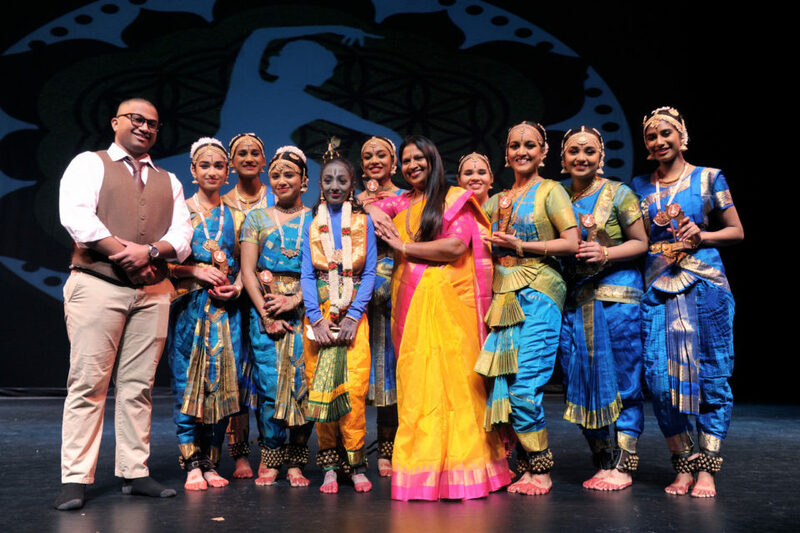 Atlanta, GA, February 8, 2019: Kalaivani Dance Academy celebrated its 15th year with a thematic presentation “Shri Krishnam” with much splendor and fanfare to a houseful audience at the Infinite Energy Performing arts Center on January 20, 2019. 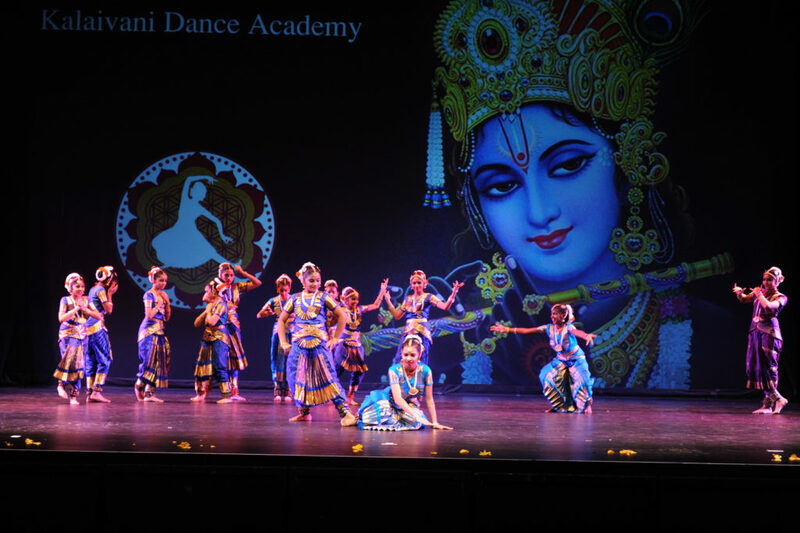 Students of the academy, under the tutelage of gurus Padmaja Kelam and Siddarth Kelam embraced the concept in all its vibrant glory, presenting Krishna and his mythological stories at its classical best. Emcees Anusha Gopali and Sanjana Kuthyar ensured smooth flow of transition between various forms and pieces with crisp and clear descriptions. Kicking off with the national anthems of US and India, the evening began with a special performance by Swaminathan Ramamoorthy and his team. Ramamoorthy, a visually impaired person has been involved in the welfare and services of people with disabilities through several organizations. The USA tour, dedicated to his father, a ten-member team from India including eight visually impaired and two caregivers, was an attempt to portray the message that given an opportunity, these especially abled individuals could also shine in their own right and lead a life of self-reliance and justice without any prejudice. Known for his mischief, Krishna’s magic and mysticism are inescapable. His exploits, be it as a butter thief or an exuberant imp sporting a peacock feather are delightful, just as the music of the flute he plays. An epitome of love, the various feats and layers of Krishna presented through the medium of classical music and dance was a visual treat to the viewer. The Nrityamala (garland of dances) opened with dancers seeking blessings from the Divine with an offering of flowers, Pushpanjali, set in Ragam Vaasanthi and Adi Talam. The youngest tots of the academy were welcomed on stage. Kasthuri Tilakam, a shlokam describing the beautiful appearance and adornment of lord Krishna set in Ragam arabhi was followed by Muralidhara Kauthuvam, a fast paced lyrical poem set to Ragam Arabhi and Talam Adi, that showcased Krishna’s mischievous tricks and heroic exploits on the banks of the River Yamuna. 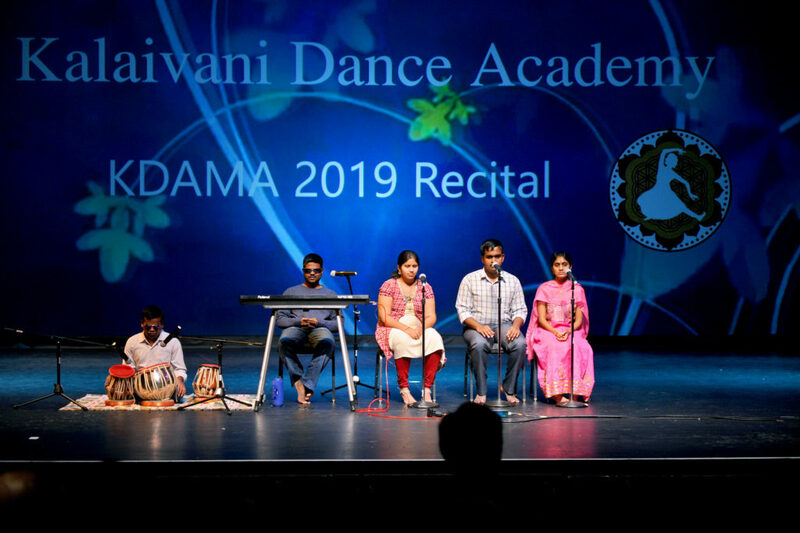 Younger students presented Krishnam Kalayasakhi, to rhythmic music of Kollaattamand Kummi, a celebratory expression of joyous abandon. Shabdam, a Madurai Muralidharan composition featuring Krishna as the supreme Illusionist who stood bearing the Govardhana mountain enraptured the audience. Krishna’s playful interactions with the gopis came alive in Kummi. Sirisha, a visually impaired member of Raamamoorthy’s troupe presented Krishna Leela Tarangam, the entire act, a balancing act on a platter. As one of the emcees commented, Sirisha was amazingly spatially aware and carried the act to a gracious end. Madhava Mamava, set to Ragam Neelambari and Adi Talam portrayed Krishna’s beauty as the Gopikas enlightened by Sri Krishna sing about the spiritual qualities of the Lord in great devotion, entreating him for protection. Tisram mayura Alaripu, inspired by the movements of a peacock, a splendid confluence of grace, beauty and precision enchanted the audience. Asainthaadum, set to Ragam Simhendra madhyamam and Adi thalam, a piece highlighting gentle movements of the peacock to announce the arrival of supreme whose feet step high with tinkling anklets in rhythmic synchronization to the swaying of the peacocks. Dancers invoked Lord Padmanabha in the rapturous Thillana, set to Raagam Dhanashri and Adithaalam. The grand finale featured Krishna caught in the coils of serpent Kaliya in Kalinga Nartana, Set to Ragam Punnagavarali and Adi Talam where Krishna dances with abandon with his twinkling feet as he overcomes the dreaded multihooded snake Kaliya and dances on his hood, liberating the people of Vrindavan. Gurus Padmaja and Siddarth Kelam thanked volunteers and students who put in months of efforts towards the event. 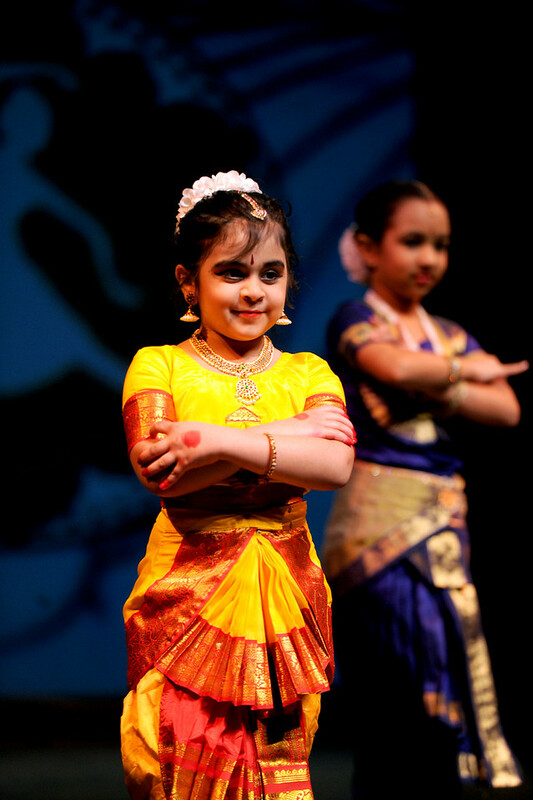 Kalaivani Dance Academy is a nationally renowned dance academy, founded by Padmaja Kelam in 2004 with the vision of engaging students in the fine art, technique, and love of one of the most ancient and graceful art forms of India that is Bharatanatyam. You may visit http://kalaivaniacademy.com/ for details.